If you’ve dreamed of country living, this property may be for you. Just bring your cattle, horses and fishing gear. The combination of grazing, recreation and easy access to both Bartlesville and Tulsa presents a property that should appeal to several interests. The Morning Star property’s access to the watershed lakes, the largest being 35 acres +/-, provide excellent recreational value while the native grass and introduced forages support the livestock base of this property. 2791 sq ft, 3 bd, 2 ½ bath ranch style home w/ wrap around wood deck. Attached 2 car garage, sandstone patio, koi pond, fire pit and Jacuzzi. 5040 sq ft Morton barn with 12’ lean-to, 3 stalls, feed storage, shop area with restroom & storage. Built in 1150 sq ft guest quarters with 2 bd, 1 bath and central heat & air. Utility services provided by Ramona Public Works. Home: The main home was built in 1998 and consists of almost 3000 sq ft of living space including 3 bedrooms and 2 ½ baths, large open living area with vaulted beam ceilings, wood burning stove, Saltillo tile, wood flooring, built in oak shelving, formal dining area, breakfast nook and laundry room. 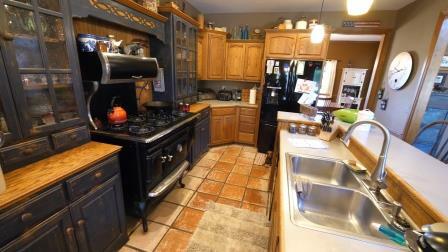 The home’s unique kitchen includes ample storage and early 1900’s replica gas cook stove and electric oven. The upstairs living space makes an excellent additional bedroom, game room or man cave. Utilities average around $350/ month with zoned central heat and air. The large fenced in backyard is ideal for entertaining and includes the wooden wrap around deck, sandstone patio with Koi pond, fire pit and Jacuzzi. Landscaping includes many native plants found in the Tall Grass Prairie, raised vegetable gardens along with apple, pear and peach trees. The guest quarters, built in 1996, contains 1150 sq ft of living space which includes 2 bedrooms, 1 bath, open living/ dining and kitchen area, gas burning heating stove with central heat. Cooling is provided by window units. Additional Information: This very accessible property is located within an easy commute to either Bartlesville or Tulsa, yet provides privacy and seclusion. The forage base provides ample grazing for a few head of cattle or your horses. Water: The 35 acre and 10 acre NRCS flood control lakes are stocked with channel catfish, bluegill, largemouth bass and offer excellent boating, kayaking and fishing opportunities. Livestock water is provided by the wet weather creek which runs from below the 10 acre lake dam and through the east end of the property. In addition, there is a 2 acre pond adjacent to the large lake to the west. Ramona public works provides water for the home and headquarters. Wildlife: The property’s location, moderate tree cover and native plant community create an ideal habitat for local wildlife. Minerals: Property transfers as surface only.